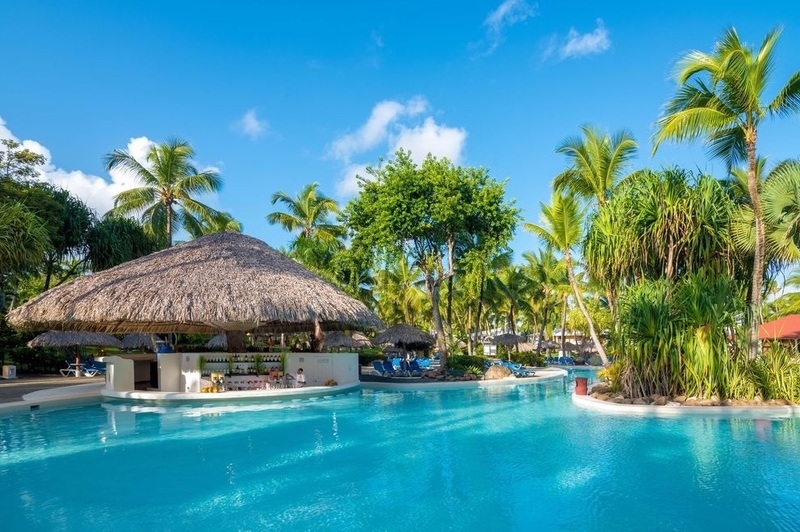 Bavaro Princess All Suites Resort Spa & Casino is an all-inclusive resort located on the beach in Punta Cana. The resort features three swimming pools, including an adults-only pool, and a variety of a la carte restaurants. The resort is close to several golf courses, including White Sands Golf Course and Cocotal Golf and Country Club. There are over 800 rooms at Bavaro Princess. Room categories include bungalow suites, junior suites, platinum suites, and honeymoon suites. All rooms have air conditioning, flat-screen TVs and balconies or patios. Private bathrooms with separate bathtubs and showers feature jetted bathtubs and complimentary toiletries. Dining options at the resort include a buffet, steakhouse, Italian restaurant, seafood restaurant, and more. There are several bars, including a swim-up bar, and 24-hour snacks are available. Bavaro Princess has a spa offering massages, body treatments, and facials; a casino; non-motorized water sport equipment; and three pools, including an adults-only pool. The resort also features complimentary Wi-Fi in the lobby, a supervised childcare program, and a complimentary beach shuttle. Featured amenities include express check-in, express check-out, and dry cleaning/laundry services. Planning an event in Punta Cana? This resort has 3,086 square feet of space consisting of conference space and meeting rooms. Free self parking is available onsite. Fly into Punta Cana International Airport, Dominican Republic (PUJ). The resort is about 20 minutes from the airport. Visit Bavaro Princess’ website for more information.